Making use of ScriptCase security resources you can implement access rules for the system being developed, further decreasing development time of a project, considering that ScriptCase will generate access applications and all validations automatically. Image 1: Security Module Menu. 1. Type - The First step is used to select the level of security. There are three security levels and each level is based on a data model for storing information such as user accounts, passwords, access profiles, groups, etc. Image2: Security Module - Type. User - It creates an application based on the security for user level (where the application is linked to user login). Application - It creates an application based on the application level security (where the application is related to the user). 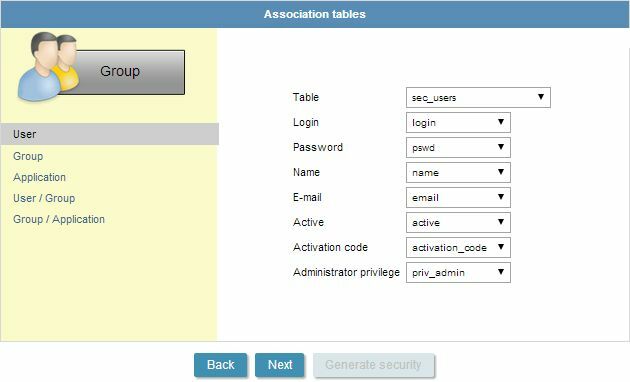 Group - It creates an application based on security for the Group level (where the access of each group to certain applications is defined). 2. Select Connection - The second step is common for any type and it is used to select what database connection will be used to create the Security module. Image 3: Security Module - Select Connection. Connection - Selects a database connection from the project. Existing or Create Tables - You can choose if Scriptcase will create the tables in your database or it it will use existent tables. Table prefix - Prefix used to create the table names. Delete tables if they exist - Deletes the tables to create new ones. 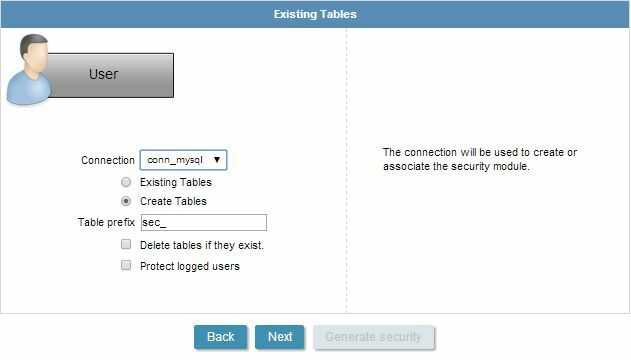 Protect logged users - Deletes the tables to create new ones. 3. 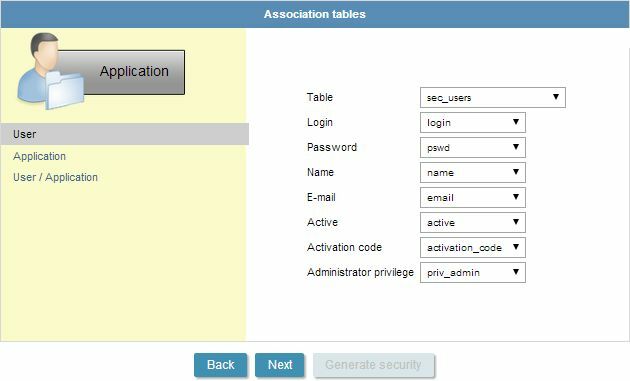 Associate - The third step is different to each type of security level and it is used to associate the fields from the security module with the fields from the database. So it is just needed if you have selected the option to use "Existing Tables" in the last step. Based on user level security (where the application is linked to the user login). Table - Defines the table "Users" used by the system. Login - Sets the field to store the User login. Password - Sets the field to store the user password. Name - Sets the field to store the user name. E-mail - Sets the field to store the E-mail. Active - Sets the field to store if the user is active or not. Activation code - Sets the field to store the activation code. 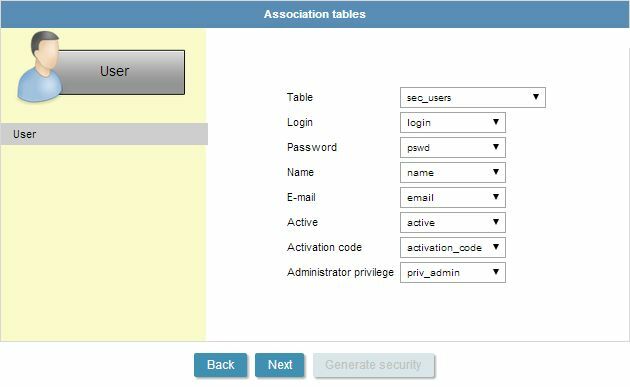 Administrator privilege - Set the field to store if the user has administrator privileges. Table - Sets the table "Online User" used by the system. Login - Sets the field to store user login. Login Date - Sets the field to store the time that the user performed the login in the system. Session - Sets the field to store the user session. IP Addresses - Sets the field to store the user's IP. Based on application level security (where the applications are related to the user). Image 5: User / App Interface. Administrator privilege - Sets the field to store if the user has administrator privileges. Table - Sets the table to store all project applications. Code - Defines the field to store the code or the application name. Description - Sets the field to store the application description. Type of application - Sets the field to store the application type. Table - Sets the table to store the relationship between groups and project applications. Login - Defines the field to store the User Login. Application Name - Defines the field to store the application name. Access Privilege - Defines the field to store if the user has privilege to access the application. Insert Prvilege- Defines the field to store if the user has privilege to insert new records in the application. Delete Privilege - Defines the field to store if the user has privilege to delete records in the application. Update Prvilege- Defines the field to store if the user has privilege to update records in the application. Export Privilege - Defines the field to store if the user has privilege to export records in the application. Print Prvilege- Defines the field to store if the user has privilege to print records in the application. Based on security for the Group level (where the access of each group to certain applications is defined). Image 6: User / Group / App Interface. Login - Sets the field to stores the user login. Table - Sets the table to store the groups created in the system. ID - Defines the field that will store the group code. Description - Sets the field that will store the group description. Table - Sets the table to store the relationship between users and groups in the project. Login - Sets the field to store your login. Group Code - Defines the field to store the group code. Access Privilege - Defines the field to store if the group has privilege to access the application. Insert Prvilege- Defines the field to store if the group has privilege to insert new records in the application. Delete Privilege - Defines the field to store if the group has privilege to delete records in the application. Update Prvilege- Defines the field to store if the group has privilege to update records in the application. Export Privilege - Defines the field to store if the group has privilege to export records in the application. Print Prvilege- Defines the field to store if the group has privilege to print records in the application. 4. Configuration - The fourth step is used to inform the settings used on the security module. Prefix applications - Creates the security applications with a prefix in the name. Encryption - Defines if the password will use encryption. Enable Security - Enables the option "use security" in each application. Use Captcha - Enables the option to use CAPTCHA in the login screen. Folder - It creates a folder in the project to security applications. Theme - Defines the theme to the applications. Log - Defines the Log Scheme used in the security applications. 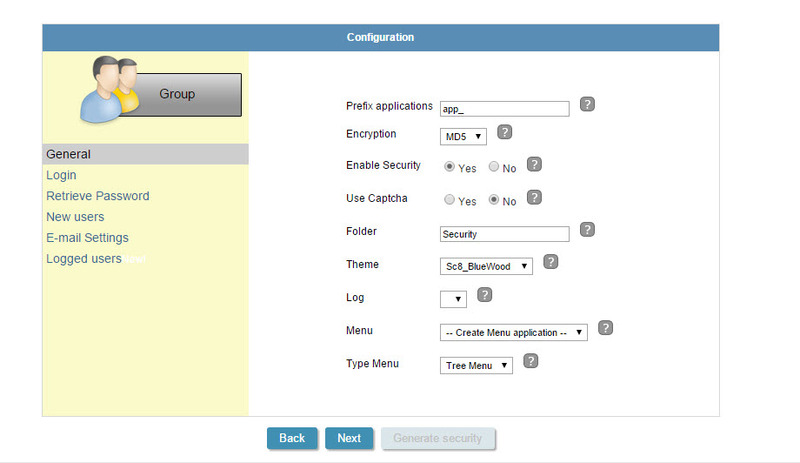 Menu - It allows to create or select a Menu application to include the security module. Menu Type - Defines the Menu type, if the option to create a new menu applications was set in the item above. Minimum size - Minimum size of characters typed by the user. Maximum size - Maximum size of characters typed by the user. Send e-mail link for new password - Define which characters the end-user can type. Send email with password - Defines if the user can retrieve the password receiving it by e-mail. Reset password and send new email - Defines if the user can retrieve the password reseting the old and receiving a new one by e-mail. Send e-mail link for new password - Defines if the user can retrieve the password receiving a link by e-mail to register a new password. Allow the registration of new users - A link is created on the login screen allowing the new user to registrate. Require activation by email - New users receive an activation link by email. Send email to administrator - When a new user is registered, the administrator receives an email to allow that user to access the system. SMTP Server - Defines the SMTP server. SMTP Port - Defines the SMTP port. Secure Connection - Defines the Security for the SMTP, whether it's SSL or TLS . SMTP User - Defines the SMTP user. SMTP Password - Defines the SMTP password. SMTP E-mail - Defines the SMTP e-mail. Show logged users - By checking “yes“ Scriptcase creates a Grid application inside the Security Module to control and display all the logged users inside the project. Brute Force attack protection - Option to use Brute Force attack protection for unsuccessful login attempts. It is a way to combat Brute Force attacks. Brute force protection period (in minutes) - If you decide to use Brute Force attack protection you must set here for how many minutes the user will be not able to log in. Retries number before lock - If you decide to use Brute Force attack protection you must set the maximum number of unsuccessful login attempts, before blocking the user. Important note: This logged users options will be available only if you check the option "Protect logged users" during the step 2. Security Module - Select Connection (step 2). 5. Insert data - The fifth step is used to populate the tables Users and Groups. Active - Activate the user. Administrator privileges - Defines if the user has administrator privileges (all features enabled). Group - Name of the administrator group. 6. Add applications - The sixth step is used to populate the table Applications. Note: This step is not needed if you are using the "User" security type. Checking this option, Scriptcase will insert the name of each application existing in the project, in the Applications Table . 7. Profile - The last step is for saving all settings in a profile so that they can be used in other projects. You can save a profile to any Scriptcase user, just for that user or just to be used in a project.